Seattle is funny in that it takes until mid-to-late July before summer really starts. Now, at the beginning of October, we wake up to freezing mornings (okay, so about 50 degrees), but by mid-afternoon, the sun is bright and the temperature has reached 72 degrees F. Seattle just doesn’t want to let summer go. So I’d take advantage of the sun and try to sneak in some more outdoor grilling before it gets really cold and wet up here. This recipe is broken up into three parts and despite looking rather involved, it’s actually a breeze and you can break this up into separate components and make it well in advance so it’s not a frantic cooking rush on the day you want to serve this. This is because panna cotta is super easy to make (and super yummy, and super impressive-looking). I grilled peaches, but any firm-fleshed fruit will work (plums, apples, pears, bananas). I added shortbread to this recipe for a buttery crunch. Mint finishes it out with a clean freshness that cuts through the spicy cream flavors of the panna cotta. Peaches (and watermelon) getting seared on the grill. I like grilling fruit, especially fruit that is not naturally super sweet. The grill slightly caramelizes the sugar in the fruit and adds a nice smokiness. Pour the cold water over the gelatin to bloom it. Add cream, vanilla, and sugar in a small pot over medium heat. Drop in the chai mix and let it steep. Once the mixture starts steaming a little (about 10 minutes), add in the bloomed gelatin and stir. Don't let the mixture come to a boil. Add the sugar to the butter and mash up with the back of a spoon until well-incorporated. Stir in flour until the dough is well blended. On a small cookie sheet, casually divide the dough into two or three golf ball sized pieces. Smush them down with your fingers until they're about ½ thick. Bake them for 20 minutes (or until their edges turn golden brown and the middle is set). Let them cool. You can store them in an airtight container for up to five days. When ready to serve, preheat the grill to about 400 degrees. 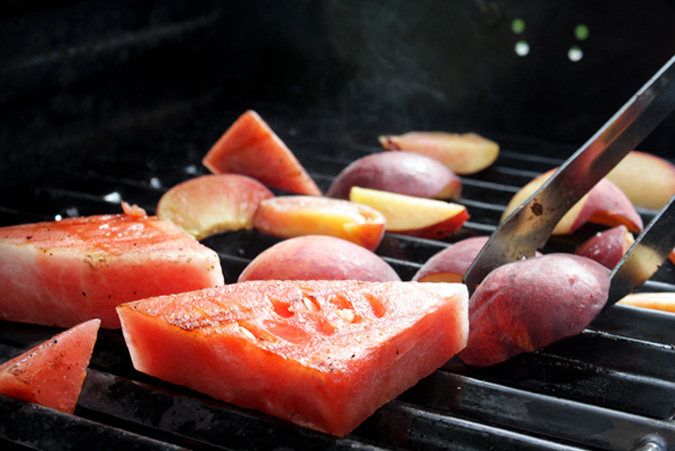 While the grill is preheating, brush each peach wedge with a little butter. Grill peaches for about 1-2 minutes per side. The lid does not have to be closed on the grill. You are aiming to soften and sear the outside, but you also want to to preserve the integrity of the fruit on it the inside. Top the cold and set panna cotta with the hot peaches, evenly divided among the 6 cups/ramekins. Break up the shortbread further with your fingers and sprinkle on the crumbles. Finally, top each panna cotta with a bit of mint.